The VW went in for its first service. Because I am under 25 I couldnt recieve a loaner car so they shuttled me to enterprise where they secured me a compact rental. No biggie, thought it was going to be a Nissan Versa or a Chevy Sonic, both alright cars for the job but no....... 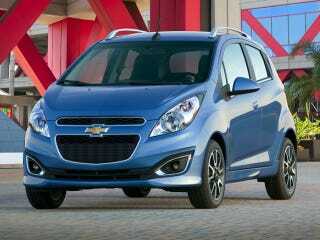 I got a fully loaded..... "Denim" blue Chevy Spark. I'm a very small guy and this car is TINY even to me. Features are nice, but the thing is beyond slow... I almost died trying to merge on to the expressway, the pedal was touching the floor and I was crawling in front of traffic doing 75-85 mph. Enterprise needs to put this thing in a class of its own. srsly.